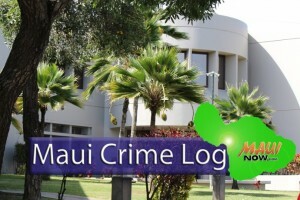 Maui Crime Log: Images by Wendy Osher/Maui Now. 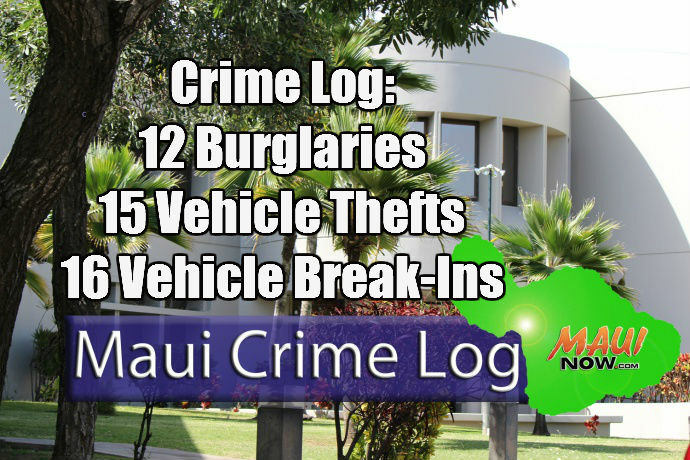 Maui police responded to 16 burglaries, 5 vehicle thefts, and 14 vehicle break-ins in Maui County over a seven day period, between March 13 and 19, 2016. Of the five vehicle thefts, none of the vehicles have been recovered. The incidents were reported in Kahului, Kīhei, Pāʻia and Makawao. Burglary incidents were down to 16 from the 20 incidents reported the week before. Vehicle break-ins were down to 14, from the 17 incidents reported the week before. The greatest number was in Lahaina, with four incidents reported over seven days. Sunday, March 13, 6:43 p.m.: 2600 block Kokomo Rd Haʻikū. Burglary residential, unlawful entry. Wednesday, March 16, 1:44 p.m.: Halelo St. Burglary residential, unlawful entry. Sunday, March 13, 5:07 a.m.: 365 Ala Makani St. Burglary non-residential, forced entry. 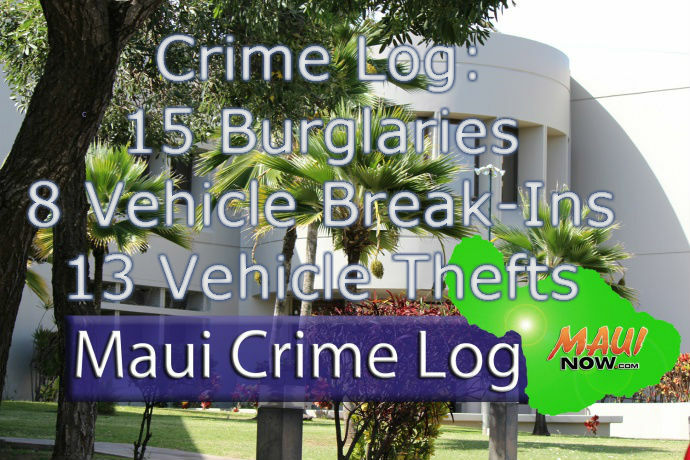 Monday, March 14, 3:50 p.m.: 100 block S Mokapu St. Burglary residential, unlawful entry. Tuesday, March 15, 3:46 a.m.: 100 block S Wākea Ave. Burglary non-residential, forced entry. Friday, March 18, 9:27 a.m.: 48 Lono Ave. at the animal clinic. Burglary non-residential, unlawful entry. Friday, March 18, 6:57 a.m.: 3100 Lower Kula Rd at Kula Hardware. Burglary non-residential, forced entry. Wednesday, March 16, 1:29 p.m.: 1000 block Houston St. Burglary residential, attempted entry. 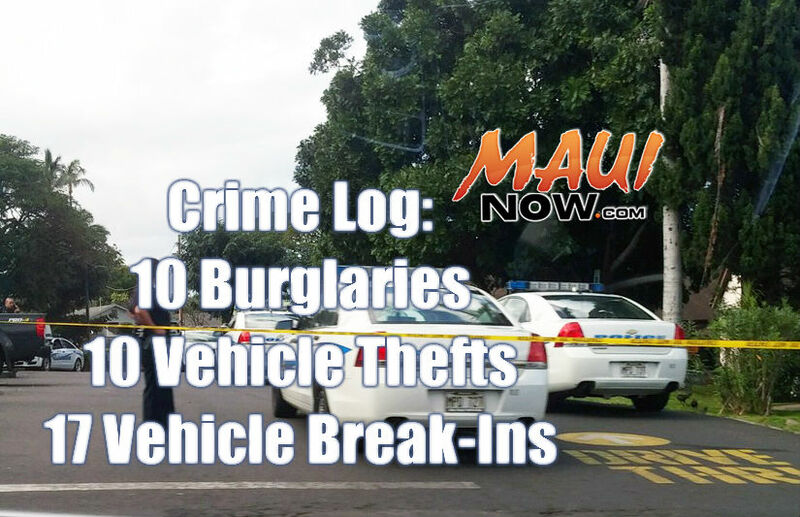 Tuesday, March 15, 11:09 p.m.: 1000 block Waineʻe St. Burglary residential, forced entry. Wednesday, March 16, 1:09 p.m.: 800 block Hoawa Rd in Kaunakakai. Burglary residential, unlawful entry. Saturday, March 19, 10:59 a.m.: 2100 block of Kahekili Hwy. Burglary non-residential, forced entry. Tuesday, March 15, 9:48 a.m.: 737 Lower Main St at Myndi`s Bridal Boutique. Burglary non-residential, forced entry. Tuesday, March 15, 3:56 p.m.: 42 Kaniela St at Happy Valley Laundry. Burglary non-residential, forced entry. Wednesday, March 16, 4:07 a.m.: 1770 Mill St at Tasty Crust. Burglary non-residential, forced entry. Wednesday, March 16, 1:51 p.m.: 700 block of Alua St. Burglary non-residential, unlawful entry. Thursday, March 17, 8:05 a.m.: 900 block of Eha St. Burglary non-residential, forced entry. Sunday, March 13, 10:30 p.m.: 400 block of Kaʻao Cir. Blue 20017 Nissan Frontier, License: MRS005. Friday, March 18, 8:26 a.m.: 2400 block of S. Kīhei Rd. White 1995 Ford Ranger, License: MDF422. Thursday, March 17, 3:38 p.m.: Baldwin Ave at Ukiu Rd. Black 1998 Toyota Tacoma, License: LCN176. Thursday, March 17, 2:44 p.m.: 1100 block of Makawao Ave. White 1998 Toyota Tacoma, License: LCP136. Tuesday, 15, 9:34 p.m.: 56 Hāna Hwy at the Pāʻia Municipal Lot. White 2000 Saturn LS1, License: JFY140. Monday, March 14, 7:57 a.m.: 1000 block of Kauhikoa Rd. White 2000 Honda CRV. Unauthorized entry motor vehicle 1. Saturday, March 19, 7:43 p.m.: Kahope St. Black 1990 Jeep Cherokee. Unauthorized entry motor vehicle 1. Saturday, March 19, 11:13 a.m.: 10200 Hāna Hwy at Twin Falls. Red 2016 Nissan Rogue. Unauthorized entry motor vehicle 1. Wednesday, March 16, 8 p.m.: 207 E Wākea Ave at the rear portion of Paradise Market. White 2001 Nissan Frontier. Unauthorized entry motor vehicle 1, theft. Thursday, March 17, 6:58 p.m.: 65 Kaʻahumanu Ave at the Kahului Shopping Center. White 2004 Toyota Sienna. Unauthorized entry motor vehicle 1. Thursday, March 17, 6:22 p.m.: Kaiau Pl at Charlie Young Beach. Red 2014 Nissan Versa. Unauthorized entry motor vehicle 1, theft. Thursday, March 17, 12:22 p.m.: Front St at Prison St. Black 2016 Jeep Wrangler. Unauthorized entry motor vehicle 1. Thursday, March 17, 6:16 p.m.: 658 Wharf St at the Pioneer Inn. Black 2016 Jeep Wrangler. Unauthorized entry motor vehicle 1, theft. Friday, March 18, 2:35 a.m.: 505 Front St. White 2010 Volkswagen Routan. Unauthorized entry motor vehicle 1. Friday, March 18, 10:35 p.m.: Front St at Prison St in the Prison Street parking lot. Black 2016 Jeep Wrangler. Unauthorized entry motor vehicle 1, theft. Wednesday, March 16, 9:29 a.m.: 4400 block of Lower Honoapiʻilani Rd. Black 2015 Nissan Rogue. Unauthorized entry motor vehicle 1. Thursday, March 17, 6:17 p.m.: Hamiha St. Silver 2014 Chevrolet Spark. Unauthorized entry motor vehicle 1, theft. Monday, March 14, 8:30 a.m.: Ili Kūpono St. Red 2004 Nissan Altima. Unauthorized entry motor vehicle 1, theft. 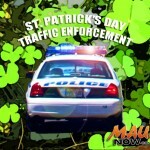 Monday, March 14, 7:30 a.m.: 1300 block of Moʻohele St. Black 2013 GMC Yukon. Unauthorized entry motor vehicle 1, theft.